1. How did you get started in fashion? I graduated from the London College of Fashion and then worked for several fashion houses, including Paul Smith, Top Man, Helen Fairbrother and Sierra. But none of these companies appreciated my talent! So in 2009 I started my own clothing line for men, Young Fox, and in 2010 I launched Kimalie, my womenswear line. 2. How difficult was it to start up during the recession? I put a lot of my own money into it, but I was lucky to get premises through the London Youth Support Trust, which also provides advice and support. It helped me apply for a grant from the Prince’s Trust. But with the economy the way it is, I decided to sell direct, online through my own website and organisations like Makerhood and Asos. I was stocked in five boutiques in places like Bond Street, but they take 50% commission and I can’t really afford that at the moment. 3. Where does the D in DK Darlington come from? The D stands for Damion, my brother. I’m the chief designer and the company director, but DK Darlington had a better rhythm! I have a lot of interns to help me. One of the guys didn’t know what he wanted to do and helped me with design – now he’s at uni studying fashion! There’s just two of us who make up the garments. 4. So how would you describe the style of your clothes? My clothes are about detail. I take a basic shape like jeans and add leather, or a shirt and add pleating. The menswear line in particular features a lot of leather. My target audience is young professionals who want to look smart but also have a touch of the street. 5. What are your main influences and inspirations? I was born in Jamaica but I’ve lived in Britain since I was about 10, so I regard myself as British – all my friends are British. I live in Clapham and hang around in Brixton a lot, so I’m influenced by the urban streets around here and other areas like Brick Lane. But I get different inspirations every season – for my spring/summer 2011 womenswear collection I used a lot of blue, yellow and white to give a very girly feel. 6. So what appeals to you about Makerhood? I just think it’s a brilliant idea, trying to get everyone in the area to buy local, and getting different makers in an area together to help each other. When I joined up there were cake makers and artists but no other fashion sellers. Now there are more fashion stalls and it’s great! 7. Finally, what’s your top tip for a bit of “unknown Brixton”? Don’t be afraid to wander around the back streets of Brixton – there are some really interesting shops and cafés just waiting to be discovered. My favourite place is Take Two – a Caribbean restaurant that serves fantastic fish soup. You can see DK Darlington’s menswear at http://brixton.makerhood.com/youngfox. He will be adding his womenswear line before Christmas. See http://www.dkdarlington.com/ for more information. A big welcome to some of the new makers who have set up stalls on Makerhood in the past couple of weeks. Claire Mant creates Mantisglass: unique, handcrafted, kilnformed glassware with bold, distinctive designs that create a focal point for your home. Youngfox, the menswear label from DK Darlington, offers an eclectic mix of formal style and street fashion, making this label the right choice for men who are looking for a blend of smart and casual. Aiste’s Art sells paintings, cards, bags with hand drawn graphics on them and felt scarves and accessories. 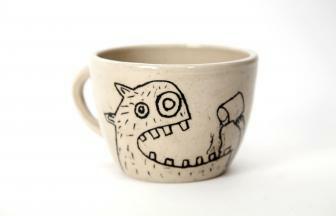 Alice of Alice Maplesden Ceramics makes pots, mainly pots with creatures on “doing stuff”, like this monster drinking tea! Carrycouture designs and hand crafts a range of luxury knitted accessories, including handbags, hats, scarves, gloves and cushion covers, usually in organic cotton, wool or mohair.